You’ve Won A Cruise! What to know about frauds and scams and how to protect yourself and your money! 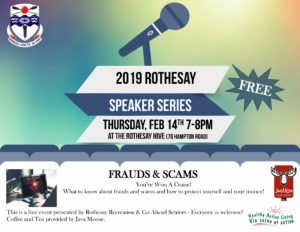 This is a free event presented by Rothesay Recreation & Go Ahead Seniors – Everyone is welcome! Coffee and Tea provided by Java Moose.